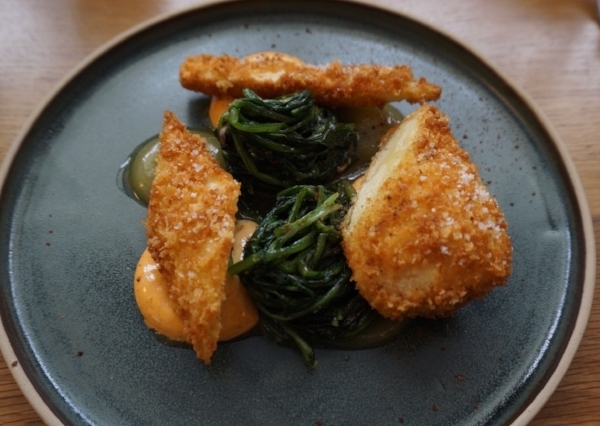 I admit that it has taken me a while to come around to the talents of Chef Giovanni Passerini, but a recent meal at his namesake restaurant Passerini has me a bonafide convert. The native Roman opened his first restaurant Rino back in 2010 after passing through the kitchens of Alain Passard (Arpege), Peter Nilsson (La Gazzetta) and Iñaki Aizpatarte (Le Chateaubriand). 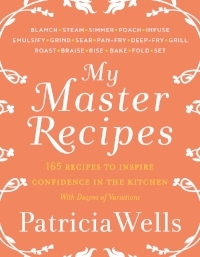 To an adoring Parisian crowd he was able to showcase his own modern style of cucina povera, but for me, in those early days, something didn’t click and my initial experience of Passerini’s vision left me uninspired. In 2014 he sold Rino, to go on to open a new restaurant and adjacent pasta shop (Passerini Pastificio) two years later in 2016 with his partner Justine. The new space, much bigger and brighter than the shoebox Rino, embraces a more sophisticated sense of modern Italian conviviality, offering shared dishes as well as an à la carte menu. The memory of a recent lunch there lingered in my mind for days afterwards, his dishes a beautiful mixture of hearty servings, delicate flavors, crunch, acid and, above all, that promised sense of conviviality that is at the heart of any good Italian meal. The Panais-Pané proved much more interesting on the plate than on the menu and we delighted in the small nuggets of creamy parsnip deep-fried in bread crumbs and served with a spicy mayonnaise, sautéed Roman chicory, and united with a small dab of gel de citron (almost like a lemon purée). The black radish with oyster sauce, smoked sardines, sorrel and endive was refreshing and harmonious, and a very original take on a light, modern appetizer. 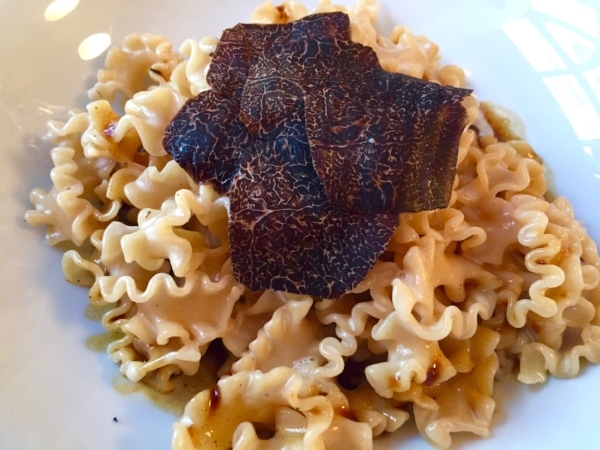 His pasta is the best example of modern cucina povera that I can think off, with all the hallmarks of comforting rustic Italian cooking, elevated to the extraordinary with thoughtful garnishes and exquisite quality produce. The ravioli, made next door in the pastificio, were filled with a dreamy concoction of potimarron (a dense, full-flavored squash), citrusy notes of orange and an earthy hit of tonka bean. The tonnarelli, a robust dried pasta of square spaghetti strands, was tossed in a hearty lamb ragout, with strips of fresh mint and a generous showering of grated fior sardo, a hard sheep’s milk cheese from Sardinia. My heart sang when the waiter brought the dessert of the last-of season fresh figs, teamed up with crunchy, caramelized pecans and a ginger and milk sorbet, the perfect end to a faultless meal. Doggy bags were requested due to the large portion sizes of the pasta, so go hungry. But make sure you go, as this is surely the best Italian meal you will find in Paris. PASSERINI | Italian | 65 rue Traversière | Paris 12 | +33 1 43 42 27 56 | Métro: Ledru Rollin | Open Tuesday–Saturday dinner. Closed Sunday, Monday & Tuesday lunch | restaurant@passerini.paris | 24-48€ weekday menus (2-4 courses), 40-65€ à la carte at dinner | Reservations essential. If I had to assign a middle name to chef William Ledeuil, it would be “Inventive.” Few Parisian chefs working today can claim his depth and breadth of creativity, not to mention originality. With his unique passion for all things Asian – be they ingredients, cooking techniques such as steaming or his major respect for dense, full-flavored bouillons – he has set himself apart from those who seem to do no more than follow a trend. The new Kitchen Ter(re), his third Left Bank restaurant, follows on the success of Ze Kitchen Galerie and Ze Kitchen Galerie Bis. Ter(re) continues his Asian flavor preoccupation– from green curries and coriander, to citron caviar, ginger and varied seaweed – but now artisanal pastas have been added to Ledeuil’s list of preferred specialty ingredients. After discovering a range of rare pastas made from ancient, stone-ground grains by miller and baker Roland Feuillas in France’s southwest, Ledeuil figured out a way to weave them into his already international approach. Kitchen Ter(re) is not a pasta restaurant, nor an Asian restaurant but another convincing William Ledeuil endeavor. The restaurant is casual, with a brief menu that may include just four starters, four or five main pasta courses, and a trio of desserts. Go as a group of four and you can pretty much sample every delicious, inventive bite on the menu. As an eternal lover of raw, marinated fish, I jumped on the marinated white fish – dorade – a burst of springtime flavor on a grey Paris day, colorful pinks and a sprinkling of green herbs, the explosive crunch of the little grains of citron caviar, punctuated by a welcome hit of fresh ginger. I would not have thought I’d fall in love with a chocolate dessert that includes the powerful soybean paste, miso, but in Ledeuil’s hands and with the addition of coffee, the dessert achieved a dense, fully chocolate flavor. Try, too, the honey ice cream paired with squash, passion fruit, and coconut. There’s a lovely Burgundy Aligoté wine of the list: The grape’s depth and personality make it a fine match of Ledeuil’s full-flavored fare. KITCHEN TER(RE) | Modern French / Modern International | 25 Boulevard Saint Germain | Paris 5 | +33 1 42 39 47 48 | Métro: Maubert-Mutualité | Open Tuesday–Saturday. Closed Sunday and Monday | |26 and 30€ (2–3 course) lunch menus, à la carte 45€ at dinner | Reservations recommended. The Food Lover's Guide to Paris 2.0 - Just Released! 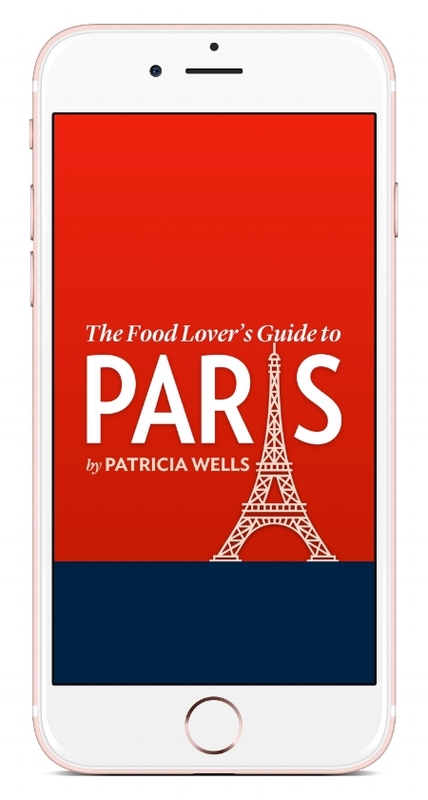 Great news for any of you Food Lovers traveling, already in, or dreaming of Paris – we have just released a stunning new version of the Food Lover's Guide to Paris for iOS 11. After several months of hard work and creative design, the ultra-talented team at Cactuslab has put together several new features and a beautiful redesign to make finding the best places to eat and dine in Paris even easier. ~ a fantastic new function to refine your search with multiple filters such as cuisine type, neighborhood, details such as Michelin stars or gluten-free, atmosphere, price, and culinary specialties. Want to search for classic and modern bistros on the left bank that are open on a Monday night or a restaurant with a well-priced lunch menu and a sidewalk terrace to watch the world go by? We got you. ~ A redesigned map section that displays multiple listings in any one area. You can use the filter function here too, to limit the addresses to the categories you are interested in. And just like the old version, the offline geolocator means you can use the map even when you are no longer connected to the internet, so you can find the best bites nearest to you at any given time. ~ A search function in the A-Z glossary so no more endless scrolling! ~ A beautiful slick new design with a new photo format to really showcase the food photos and whet your appetite. For those of you who already have the app, simply update your existing app free of charge via the App Store app, to get the latest version. If you don't have the app, you can download it from iTunes or directly on your device via the App Store app for just $4.99. As the French say, bon app! NoGlu appeared on the Paris food scene back in 2012, when restaurants and bakeries catering to those on a gluten-free diet were hard to come by. Since opening their first restaurant in the 2nd arrondissement, the brand has proliferated rapidly to include locations in the 3rd and 7th, as well as an outpost in New York. My local Noglu in the 7th arrondissement is a light and airy café offering a fresh, varied menu with an emphasis on healthy café food. Everything, of course is gluten free, and many dishes also offer vegan substitutes for dairy products. The Avocado Toast with Gomasio arrived exactly as described, a generous slice of toasted chickpea and rice flour bread (Noglu’s standard loaf), topped with slices of perfectly ripe avocado, and showered in microgreens and Gomasio, a Japanese toasted sesame seed seasoning. The pastry crust of the quiche was very convincing, crisp, flavorful and well cooked, with a filling of sweet potato and feta. Desserts were a little disappointing. The lemon tart was ‘correct’ as the French like to say, meaning “as it should be” but far from outstanding, let down by a slightly undercooked crust. The vegan raspberry layer cake was sadly inedible, with a very dry crumb and a vegan cream that, although made in house, tasted like an industrial cream from a can. The madeleines, however, are a convincing gluten free version of this classic shell-shaped tea cake. For the gluten-free home chef, the Noglu team has put out a cookbook that includes a very good gluten free flour mix, as well as recipes for madeleines, chouquettes (a childhood afternoon treat made from choux pastry and topped with pearl sugar) and their satisfying savory chickpea loaf. There are friends we love despite their faults, so we stick by them anyway. The 7th arrondissement fish restaurant, Divellec, is a bit like that for me. The brasserie-sized restaurant, overlooking Les Invalides, was recently re-incarnated from the 1980s Le Divellec, a rather haughty but quality businessman’s lunch place. Today, chef Mathieu Pacaud – son of Bernard Pacaud of L’Ambroisie and owner of Hexagone – is in charge, and though the restaurant only opened in December of 2016, it has surprisingly received a Michelin stars right out of the starting gate. Let me start with what I love about Divellec: With each visit I am charmed by the makeover of the décor with its ocean-like shades of blue, comfy wicker arm chairs, the mix and match of selected pottery, and ultra-slim stems of the wine glasses – all of which have the right touch of class and elegance. The staff, too, is spruced up, smiling, sometimes a bit distant and corporate perhaps, but they make you feel taken care of. Some of the food can be spectacular as well as beautiful, like the gently poached oysters bathed in a brilliant green watercress sauce and topped with a spoonful of caviar. It’s full-flavored and satisfying, set in a white porcelain, shell-shaped bowl. Technicolor food at its best. Their sole paired with fresh, seasonal morel mushrooms is a delight, the fish plump and flavorful, perfectly moist, with a touch of sweet vin jaune from the Jura in the sauce. Sommelier Claude Esambert – an upright Frenchman back from a decades-long stint in California – is outgoing and knowledgeable, giving us the details of one of my favorite white wines, the Burgundian Saint-Aubin from Hubert Lamy. The kitchen clearly understands deep-frying, and their current appetizer – which arrives almost the moment you sit down – is a dream: ultra-crispy, tiny, deep-fried eperlans (smelt or whitebait), the ideal starter to pair with a glass of Champagne rosé, such as the popular Billecart Salmon. On this particular visit, everything from the simple raw ecrevisse (crayfish) topped with a colorful vegetable mix, fresh herbs, and bathed in a bright vinaigrette; to the moist, perfectly cooked sea bass paired with pasta shells stuffed with ricotta and herbs, made for a truly pleasant, lunchtime meal. There is great attention to detail with top suppliers here: chocolates from Jacques Genin, cheese from Marie Quatrehomme, breads from Fréderic Lalo of Le Quartier du Pain, and olive oil from the famed cooperative in Mausanne-les-Alpilles in Provence. But there are problems with Divellec, ones that I am surprised got past the Michelin inspectors. Fish is very hard to get right, and Divellec fails more often than it should, with dishes that are underseasoned or not totally thought out. At times the kitchen favors presentation over flavor. On my first visit, I ordered their langoustines wrapped in pastry and deep fried. But sadly these lovely crustaceans were smothered in a white napkin, and covered by an ostentatious glass cloche, which turned what should have been crispy gastronomic treasures into a soggy, sad mess. One order our ormeaux (abalone) was so tough it was inedible, and I did what I rarely do, returned the dish. In its place arrived a perfect platter of well-seasoned bar (sea bass) ceviche, but one doesn’t expect to send anything back to the kitchen in a 2-starred restaurant. I have been to Divellec several times since it opened yet strangely I have never, ever, seen a chef in the dining room. What the restaurant lacks is someone in charge, someone who personifies the place and rules with a sense of style and perfection. But the worst sin of all came on our last visit when the host of our party of eight decided he wanted a glass of red wine. We requested the wine list but the sommelier simply went ahead and poured an unordered glass of red. When I asked my friend how the wine was, his response was an unenthusiastic “okay.” I sniffed it, and could tell instantly it was seriously corked, with a strong scent of spoilage. The wine was quickly replaced, with an apology for the flaw, but the damage was done. This just should not happen in place of this caliber. Prices here can be overwhelming, especially if you order their turbot, whole sea bass, lobster or whole sole, priced by the gram. Despite all of this I will surely go back, for the creative fish combinations and presentations, great ideas for what I might recreate at home, as well as the magical chocolate soufflé made with Jacques Genin’s grand cru chocolate. But I do hope that someone takes charge of Divellec. The restaurant has been mostly deserted on my visits, and just does not have the sort of joie de vivre a restaurant like this should exhibit. Someone there needs to wake up! Having been anointed with the passion for cuisine while helping run her grandmother’s road-side restaurant in Hai Phong in northern Vietnam as a child, chef Do now finds herself the third generation in a line of female chefs. After a brief flirtation with French cooking at Alain Ducasse’s Jules Verne restaurant in the Eiffel Tower and Restaurant Beauvilliers in the 18th, Do has returned to her native cuisine, with her husband at her side in the kitchen. The small eatery makes clever use of the space, reminiscent of an outdoor street market in Vietnam: The steamy, fragrant, open kitchen bustles with activity, and shelves are stacked with beautiful Vietnamese-sourced ceramics and bunches of fresh mint and coriander. The countertop bar in the restaurant’s window overlooking the kitchen is particularly appealing for dining solo or as a couple, beneath the light of the suspended sea urchin lampshades. Do et Riz offers a roster of Vietnamese classics on the small but ultra-fresh menu (ingredients are sourced daily from the nearby marché d’Aligre), including the aforementioned golden crunchy chicken and prawn spring rolls (nems); Bahn Cuon steamed rice crepe rolls filled with chicken and mushrooms: fresh spring rolls with duck breast and green papaya:, and there’s always some version of a green papaya or lotus salad, refreshing and pleasingly spicy. The Pho soup and Bo Bun noodle salad are a staple of the menu (an explosion in the popularity of the Bo Bun in Paris in the last five or so years means that it’s almost impossible to find a Vietnamese restaurant that doesn’t serve it), but the main course menu changes more frequently. On our last visit we sampled chicken meatballs perfumed with kaffir lime, and served with a spicy tamarind sauce; and a prawn coconut and noodle salad, fresh and invigorating, filled with Asian greens, mange-tout green beans, carefully butterflied tender pink prawns, all showered generously with fresh coriander. Their seductive version of a classic tapioca coconut pudding is alone worth returning for: creamy, not too sweet, and punctuated with the refreshing tang of perfectly ripe mango. 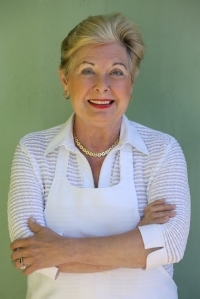 And now here’s another reason to return to sample Do and her husband’s cooking, with the announcement of plans to soon open a second restaurant across the street. It will be named Em (meaning younger sibling in Vietnamese), focusing on grilled dishes. Do et Riz | 31 rue de Cotte | Paris 12 | +33 1 43 45 57 13 | Métro: Ledru-Rollin | Open Monday dinner – Sunday lunch. Closed Sunday dinner and Monday lunch | Lunch and dinner 30-35€ (for 3 course) | Rservations essential. Anyone looking for an honest food experience from Southwestern France should head for Dans les Landes, a vibrant, always bustling café/bistro that resounds with authenticity. Everything at this spot is true and flavorful, from the tastefully breaded and fried rings of baby squid (chipirons) to the smoky pork sausages served with the tiny pickled peppers known as guindilla. Although not traditionally from the region, their Asian spring rolls with a Southwestern touch are worth a try too: here wrapped in traditional rice paper but filled with an avalanche of vegetables and bits of flavorful duck (the prized bird of the region), with leaves of lettuce and sprigs of mint for wrapping the rolls in, accompanied by a perfectly spicy sauce. Dishes are advertised as tapas portions, but each tapas serving can easily be shared by two hungry diners. Make sure to order the local Iroulegy wine, white or red, both of which are organic. Service is swift and friendly, décor right out of a sports bar, with lots of sports team banners and it wouldn’t be the Southwest without a few hanging cured sausages and dried Espelette peppers. One of the more welcoming soba noodle restaurants to grace the Paris restaurant landscape is Abri Soba, a casual, friendly spot in the 9th arrondissement, just down from the Cadet métro stop. Run by Katsuaki Okiyama of the excellent restaurant Abri, in the 10th arrondissement, Abri Soba adds a new definition to the wholesome buckwheat (sarrasin) noodle. With its warm wooden décor and open kitchen, the compact restaurant has a Japanese country aire and breathes authenticity. I already want to return, having eyed the tempting cold soba noodles paired with crispy shrimp tempura. Everything has a careful -- yet hardly precious -- aesthetic sense here. The warm soba noodles arrive nestled in a mahogany-toned hand-crafted bowl, garnished with crisp sheets of jet-black nori, or strips of dried seaweed. I’d return again and again for the cold soba noodles topped with strips of tender chicken, crispy fried onions, and a touch of greenery, all presented in an elegant, light blue and white ceramic bowl. Just add a glass of Kozaemon Junmai Daiginjo sake, and you’re on the road to heaven. Note that the noodles are 80 percent buckwheat, and 20 percent wheat flour, so are not suitable for for those with gluten intolerances. Note also that the restaurant does not take reservations. ABRI SOBA | Japanese | 10 rue Saulnier | Paris 9 | Open Sunday dinner and Tuesday through Saturday. Closed Sunday lunch and all day Monday | No reservations.